The right choice here is a NO vote on the referendum and a vote for the very best City Council members on the ballot. The City of Clearwater is operated under the Council/Manager form of government. In this structure, the Mayor is not the principal decision maker. Day to day, operations, hiring and firing, and City Council policy implementation are handled by professional City Manager appointed by the City Council. Bill Horne is the current Clearwater City manager; he makes just over $200,000 Dollars per year. If you happen to live in Clearwater and the name Bill Horne doesn’t ring a bell, that’s just the point. Horne is a manager not a politician. His job is to make the City run safely and efficiently and stay out of the headlines. A while back, a group of Clearwater “businessmen” began circulating a plan that would change the City of Clearwater from a Council/Manager form of Government to a strong Mayor form of Government. You can get more detail from Tracey McManus Tampa Bay Times Staff Writer, A strong mayor for Clearwater? Some think it’s time. Clearwater would be wise to follow Lakeland’s example and send a resound NO on election day. If you do some research, you will find that most of these efforts are brought by local “business people” not a group of regular citizens. Business people like the strong mayor because he/she is a politician, and they are much easier to influence than a City Manager, who does not need their campaign contributions. Clearwater only needs to look South to St. Petersburg and see the current strong mayor mess with a pier that the public did not want and is now behind schedule and over budget, a wastewater system that is struggling, questionable staffing at City Hall and more lies than they can count. One of the sales tactics the “business people” are using to promote this referendum is the assertion that a strong mayor would be better equipped to “deal” with the Church of Scientology and its continued growth in Clearwater’s downtown than the current system. Read that - the big players would like to be making more money in downtown Clearwater, and the Church tends to get in the way. I would offer that a strong mayor would not be particularly effective in dealing with what these “business people” see as a problem, and I suspect the Church of Scientology would be just fine with an elected strong Mayor. If you’re interested in whom the business community is talking about running for the strong Mayor slot in Clearwater check out this recent article by Tracey McManus Tampa Bay Times Staff Writer, As Clearwater prepares to vote on strong mayor, the question is who would run? 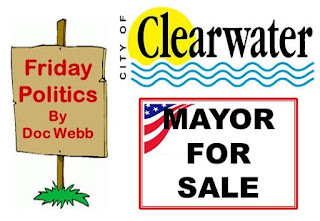 A strong mayor form of government in a City dominated by large, powerful entity with significant land holdings is not in the interest of anyone who lives in Clearwater. The people promoting this change do not understand how these two forms of government work, and their view that they can put their guy in and all will go like they want shows a complete lack of current political reality. The citizens of Clearwater are much better served by a City Manager, who has their needs and wants clearly in view and is not fishing for campaign dollars to get re-elected with every decision.